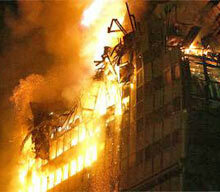 The fire described as the worst in Madrid's history has reportedly broke out because of a short circuit. Firefighters, battling a skyscraper office block blaze, have estimated that the temperature in the 106m-high Windsor skyscraper reaches 1500 Degrees Celsius. The tower, located in the heart of the capital's financial district, had been undergoing renovation since mid-2003. It is one of the most familiar buildings on the modern Madrid skyline, with the area having undergone major renovation over the past 30 years.